I took the train to Hiroshima. I’m not sure why, really. 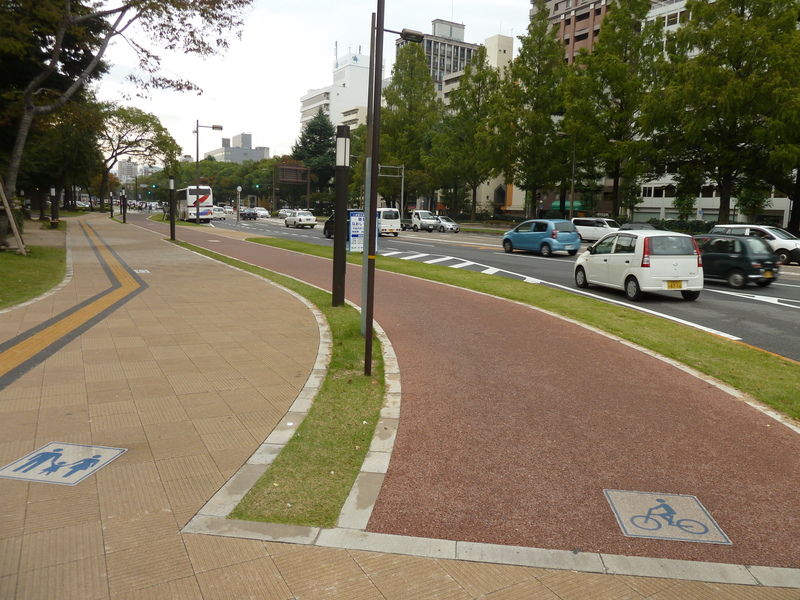 There are so many other places in Japan that seemed more appealing. The guide books showed pictures of the turquoise blue waters of the Okenawa islands and the foggy peaks of the Hida mountains—but something drew me to Hiroshima. Perhaps it was just American guilt. I wouldn’t be the first. “Many, many Americans go to Hiroshima,” my friend Naoko had told me a few days before when I had been in Tokyo. I went to the Kyoto train station to buy the ticket to Hiroshima and realized that it was going to be almost $200 on the bullet train. It seemed expensive, but I didn’t care. I needed to get out of Kyoto. Kyoto had drawn me in. 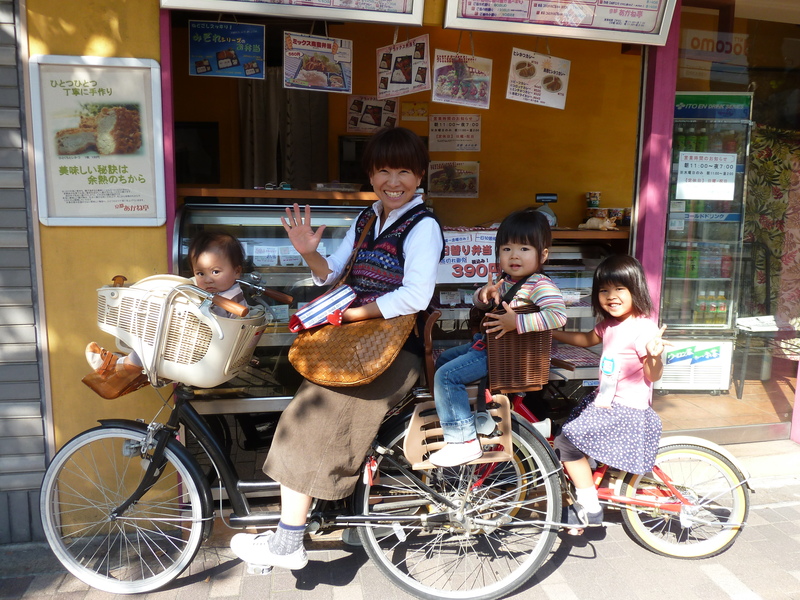 Exploring Kyoto by bicycle was like having a conversation with the person you’re falling in love with. The intonation of their voice has a command over you. You listen with vigor. Time passes and you don’t notice. Dreamy, sunny days passed too quickly in Kyoto. Every detail of the city seemed worthy of observation and reflection. I wasn’t forcing the city to show me its beauty though. I went to a few temples and gardens, but mainly I just biked. At the end of the day, I’d sometimes discover that I’d inadvertently visited a few of the “must-do” tourist destinations. I arrived, unknowingly, at the famous Nishiki Market because I had been in search of something interesting to sate my hunger, not because I felt compelled to check it off the list. I walked my bike past the stalls of pickled vegetables, dried fish, and mochi balls and I felt like I’d discovered the market. Maybe that was what travel used to feel like before the Lonely Planet, Birnbaum’s, and Trip Advisor told us what to do. The temples were beautiful, but I liked watching life go by in Kyoto more. 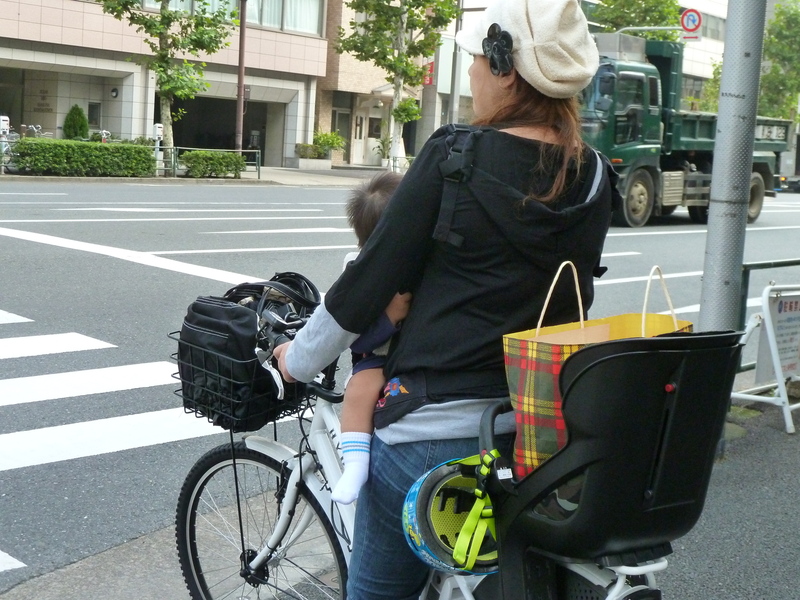 I stopped behind a mamachari at a traffic light and saw two small, delicate, bare feet poking out from the footholds of a sturdy plastic child seat. The light turned green and as I biked past I looked into the child seat and saw a fat baby sleeping soundly, hidden from the sun by a cotton bonnet. Grocery stores were brimming with seniors during the middle of the day. 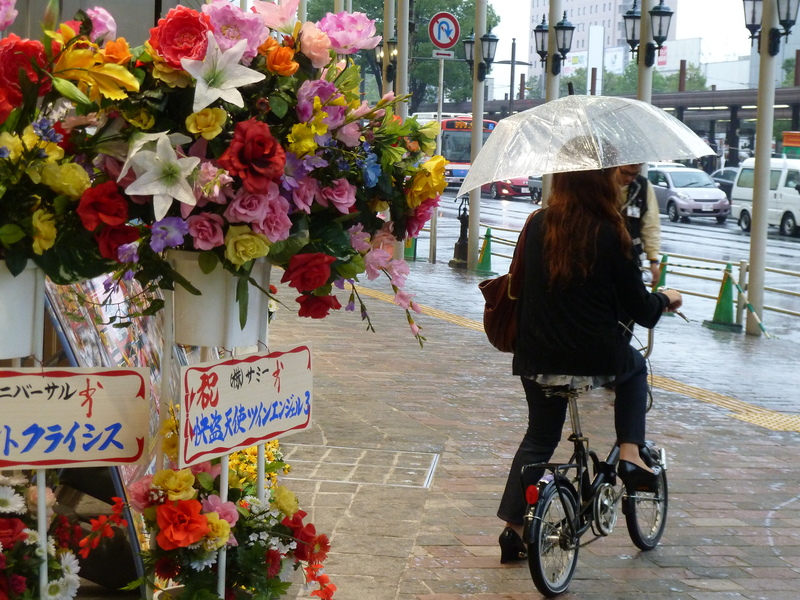 Outside of the store they’d stoop over their bikes and load their groceries into wide front baskets with their knotted hands, taking care not to damage soft produce or bouquets of flowers. Then they’d glide off, barely pedaling, moving through the universe slowly, yet effortlessly it seemed. (The electric assist batteries on many of their bikes may have contributed to this effortless look.) I spent hours along the Kamo River reading and watching the riverside bike path fill with commuters as afternoon eased into evening. I actually didn’t like Kyoto when I first arrived, but my negative first impression was largely the result of a trying travel day. The Japan Railway Company has these cumbersome rules about bikes. There is no extra fee for bringing a bike on a train, but bikes must be in a case or plastic wrapped. These rules, I learned from Professor Hiroshi, were basically born out of fears that unsuspecting passengers might brush up against a dirty bike chain while boarding the train and stain their pant leg or dress with black grease. 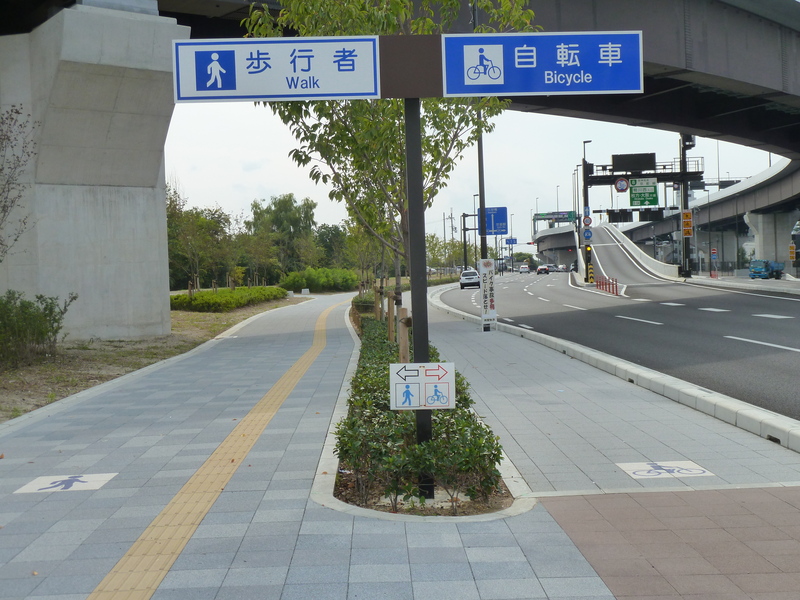 There is one train line in the Shimanami-Kaido region where the rule has been waived in order to promote bike tourism, however, in every other part of the country the rule is strictly enforced. So, my train trip from Tokyo to Kyoto began with a visit to a large department store near the train station where I tried to find plastic wrap or large plastic garbage bags. The department store had five levels, but unlike an American store, the aisles were incredibly narrow and the thousands of different products labeled with Japanese characters seemed to be towering over me and all around me. I found the garbage can section of the store, but couldn’t find any plastic garbage bags. I wandered up and down the aisles and from level to level—the number of household products and accessories was overwhelming. The high-pitched Japanese pop playing throughout the department store began to make me feel anxious and my frustration compounded as the minutes ticked by. Japan doesn’t cater to English-speakers; I had temporarily become illiterate and unable to communicate my questions and needs. I took a deep breath and began to systematically scrutinize anything that looked like a plastic garbage bag. Eventually, I found them tucked on the bottom shelf of the kitchen supplies section. The roll of tape I needed was easier to locate, but the entire shopping experience left me feeling incompetent. It was supposed to be quick stop and I had spent almost 20 minutes zig-zagging through the store. Shortly after leaving the department store I found myself in front of Tokyo Station, one of the busiest train stations in the world, where I took the wheels off my bike, put them into a garbage bag, and then taped multiple garbage bags around my frame, seat, and handle bars. Thousands of people hustled by me during those 15 or 20 minutes of awkward disassembling, wrapping, taping, and repacking, but I felt invisible. Everyone else seemed deeply engaged in the Friday afternoon rush, as if getting on their train would be their salvation. Everyone else seemed to be part of a massive, tightly-packed school of fish that sliced quickly and knowingly through the train station. I was different. I was disoriented and floating alone—harnessed to a bike covered in white plastic garbage bags and bands of tan packing tape. I limped through the train station, crippled by the weight and unwieldiness of my amputated bicycle. The shoulder straps I attached to my panniers dug into my neck, the fork of my bike gouged my shin a few times, and my wheels—which I’d looped through one of my shoulder straps—shifted unpredictably with each step I took. When I got to the bullet train ticket gate I put everything down. I was tired and unsure of how I was going to maneuver through the narrow gates with my wide load. A young and slightly overweight Japan Railway employee in a navy blue suit with gold buttons and cuff links appeared. He spoke in Japanese at first and then laughed nervously when he realized I didn’t understand what he was saying. Finally he sputtered out a few words of English indicating that he was going to put my bike on the train for me. He gracefully marched away with perfect posture, holding the frame a few inches from his body. His uniform, buffed dress shoes, and seriousness seemed in disaccord with my strangely clad bicycle. Tape was coming undone in places and a plastic bag hung off the back of my bike, dragging along the floor as he walked. I almost started laughing, but instead I picked my things up and hurried after him and my bike. “Arigatou, arigatou,” I thanked him after he wedged my bike into a little slot at the back of a train car. The few Japanese words I know seem to exit my mouth with a Spanish accent. The interior of the bullet train looked like an unusually wide airplane cabin. It was spotless and all the other passengers looked so polished with ironed shirts, firm leather briefcases, and expensive watches. I felt underdressed and I seemed to be the only person that wasn’t contemplating the screen of some type of electronic device. I thought about how possessions can complicate our lives and even make us unhappy. I’d been living happily for months with just four panniers worth of belongings. I probably could have made it with even less. There’s so little that we really need. It was downpouring when I arrived in Kyoto that evening. I ripped the tape and plastic bags off my bike and put the wheels back on outside of the train station. Hundreds of commuters with umbrellas were scurrying urgently in and out of the train station. Everyone seemed eager for something—to change out of their suits or heels, to see the kids, to kiss their lover, to get drunk, or maybe to just zone out in front of a TV. I attached my panniers to my bike and put my rain jacket on. The rain wasn’t going to stop and I accepted that I was going to get drenched. I took a look at the map I had of Kyoto, but it meant nothing just yet because I didn’t know east from west or what the name of the street was that I faced. I didn’t feel like asking anyone for directions and didn’t really care if I got lost. I pushed off the ground, out from under the shelter of the train station entrance, and then fat drops of rain started pelting me. I eventually arrived at the guesthouse I was staying at and hung my soaked clothes up to dry while I settled into the room. I was cold so I got in bed and closed my eyes, but my stomach kept reminding me that I skipped lunch and I knew I need to get something to eat. It had stopped raining, but I could hear rainwater dripping off of roofs into the puddles that had formed along the dark side street I walked down. The air in Kyoto smelled different than Tokyo. 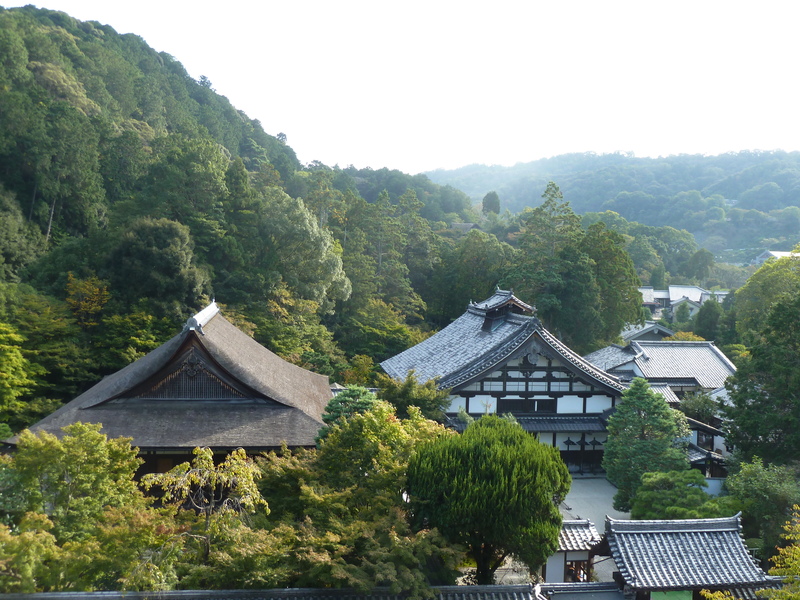 In the morning I would see the deep green mountains surrounding the city—the fir trees in front of the Nanzenji Temple, the cherry trees at the Imperial Palace, and the bamboo groves to the north—but on that first night I could just faintly smell all that vegetation. I walk to a commercial street and find a little bar that’s packed. The windows are steamy and the people inside seemed buzzed, intoxicated by booze and the freedom that Friday afternoon brings. I’m drawn in and sit at a counter facing into the kitchen. I drink a beer. The cold liquid slides down my throat in this really satisfying way and I can feel the alcohol settling into my empty stomach. My shoulders relax and the shuffle of my thoughts slows down. I allow myself to be completely mesmerized by the staff yelling orders back and forth, the sous chef’s furious chopping of vegetables, and the interactions of other people in this bustling bar. There’s so much energy at some tables—people are telling animated stories, flirting, teasing, bragging, and whispering secrets in each other’s ears. My food comes, and it tastes alright, but the scene is amazingly satisfying. I get back to the guesthouse and it starts raining again outside. The rain drums the metal eaves outside my window. That sounds makes me feel something, but I can’t quite find the word. Then I realize there is no English word for how I’m feeling. I feel safe, and warm, and cozy, but that’s not quite it. I feel hygge. My Danish friends told me that families and individuals create and cultivate their own concept of what hygge means to them and I know for sure at that moment that I feel hygge. Kyoto was my last week of Aloneness. I feared solo travel intensely before I left for this trip, but the freedom of being alone is what I’m going to miss the most. I don’t think I even understood what freedom was before this trip. When I started my trip five months ago in Denmark I tread softly at first. Suddenly I didn’t have a calendar telling me I had meetings, or friends calling, or family dinners, or soccer games, or even a boyfriend sending me e-mails. Everything in my life had changed so dramatically, so quickly. It was as if the laws of gravity had been altered. The people, organizations, routines, obligations, and expectations that had kept me grounded and made me me had vanished. I decided that first week in June that I wanted to and needed to understand Aloneness. I avoided socializing with other travelers at the hostel I stayed at those first two weeks in Copenhagen. I wasn’t seeking companionship. I ate meals at strange times. My plans evolved as I went based on how I was feeling. One day I biked out to a white sandy beach near Copenhagen and I sat in my bikini reading, snacking, sipping beer, and staring out at the Øresund Strait for hours. When I began to feel the chill of the early summer evening I packed up and biked slowly back to the center of Copenhagen. I think that was the day I realized I could do it—I could be alone for the next few months. I was traveling alone and I was overcome with happiness. Not the bubbly happiness you feel when you’re laughing with your friends. Not the warm happiness I feel when I’m with my family. Aloneness offered a placid, peaceful happiness. This new way that I could feel happy was a discovery for me. I’d never really spent that much time alone before this trip and I had certainly never genuinely enjoyed being alone before this trip. I grew up with two older brothers. I was born into Togetherness. I sat in the middle seat when we‘d go on outings in the family station wagon. The three of us would draw invisible lines on the beige fabric seats and we’d try to protect our backseat plots of territory, but inevitably Matt would end up asleep, with his warm cheek resting on my shoulder, and Gabe’s long legs would cross the boundary lines and rub against mine. I’d say annoying little sister things like, “You have such hairy legs, Gabe!” He’d scowl at me and then use me as his pawn, trying to convince me to stick something up Matt’s nose while he was sleeping. I liked being Gabe’s pawn because it made me feel close to him—useful even. If I got scared at night I’d sleep in the bottom bunk of Matt’s trundle bed. I’d run into his room and tell him that I heard something outside or that the wind was blowing really hard. “What if a tree falls on the house?” I’d whisper. He’d mumble with his eyes still closed that everything would be fine—and I’d believe him. Whatever seemed dangerous to me when I was alone in my room became benign in his presence. My childhood was the opposite of Aloneness; my identity was shaped around Togetherness. I like the comfort, security, and distraction that Togetherness offers, but I’ve come to really appreciate Aloneness too. This trip has been about biking, but it’s also been about understanding how to be alone. I have memories that are all mine now. I mourned the impending loss of my Aloneness while I was in Kyoto. I was getting ready to say goodbye to Aloneness and I realized it was going to be as hard as all the other goodbyes. I know every time I bike through a city late at night by myself I’ll be able to have a brief visit with Aloneness, but it won’t be quite the same. I’m home now. I’m back in Seattle and I still haven’t reactivated my cell phone. I need to. I really do, but for some reason I feel like that will be it. That will be the official end of my trip. Without a working cell phone I can convince myself that I’ve just been a visitor in Seattle for the last week. Without a working cell phone I’m still allowed to ask strangers on the street for directions. I was up near Kenmore on Monday night and I was trying to keep up with the cyclist in front of me. We got to the part of the Burke Gilman trail that’s under construction and while we were both carrying our bikes down a small set of stairs I asked him if the detour signs were easy to follow. He said they were easy enough to follow because he did this ride every day, but I could bike with him if I was worried about getting lost. We got to talking while we were biking together. His name was Ben and he has been commuting by bike from Ravenna to his engineering job in Totem Lake for 11 years. I apologized for my rattling fender. I explained that I’d just reassembled my bike a few days ago and that the fenders didn’t seem to fit quite as nicely as they used to. He said he hated it when his bike made weird noises, but he didn’t notice it when other people’s bikes were whiney. He asked me where I’d been. I told him. He said he was going to Tokyo next week for work. 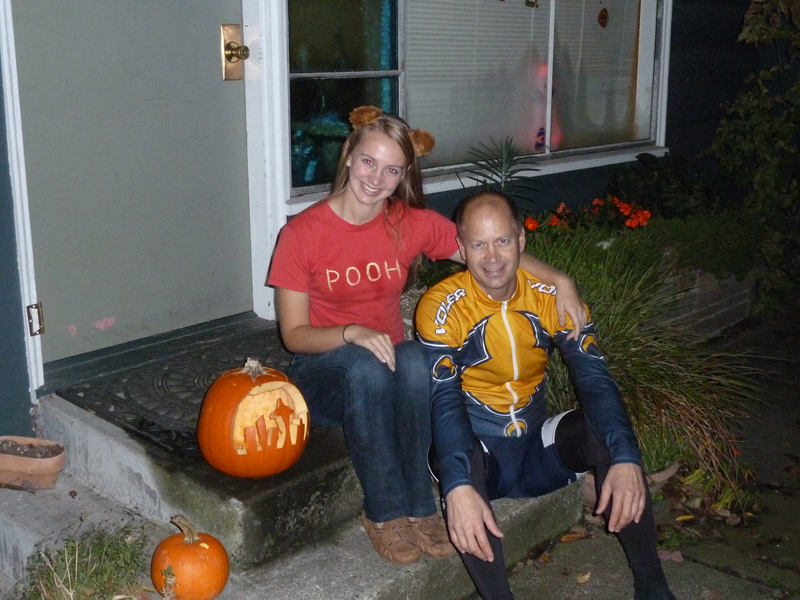 It was Halloween and little kids in costumes were walking through the residential neighborhoods we biked through. We went by a house where someone was making curry. I told him about my fellowship and we talked a little bit about biking. He said he’s been biking to work all these years because it’s easy. It takes 50 minutes to bike and 35 minutes to drive, but driving gives him a headache. When he does occasionally drive in, he always regrets it. He said Seattle is a much safer place to bike in than it was 11 years ago and that drivers are a lot more aware of cyclists now. Still though, he can’t read the comments section of Seattle Times articles about cycling. “Some of those anti-cyclist comments make me feel like I’m going to have a stroke,” he says. I tell him it’s strange being home and that I guess I need to buy a helmet because I’m not in Europe or Japan anymore. He isn’t judgmental that I’m not wearing a helmet and he listens to me talk about how I’m uncertain about what’s next for me. We talk about how the section of the detour route we’re on is dangerous; the cars are going too fast. He says he’ll be happy when the repairs to the Burke Gillman are complete. We get to Lake City Way and he tells me he has two extra helmets at home that are almost brand new. He says if I don’t mind meeting his wife and kids that I should swing by and grab one. “Really? You don’t mind?” I ask. He says he’d sleep better knowing I have a helmet. I spare him my usual diatribe about helmet laws and agree to come get a helmet from him. Saying yes to experiences and interactions with new people makes me feel like I’m still traveling. We get to his neighborhood and he says hello to several of his neighbors who are out trick-or-treating with their kids. We lean our bikes against one of the pillars of his carport and he invites me into his living room where his teenage daughter, Stella, is doing her homework. Ben goes to get the extra helmet, and Stella rolls her eyes with a smile when I explain that I met her dad on the bike path and he wanted to give me one of his extra helmets. “Oh god,” she laughs. I like her. We all talk for a little while and then I need to get going. I thank Ben for the helmet and he shows me to the door. “The best thing about cycling is all the great people you meet—isn’t it?” he says. I agree wholeheartedly. And so I bike away wearing a helmet that Ben bought for a Japanese co-worker who came to visit a few months ago. I feel good about the world for the moment, but oddly enough it makes me think about my daytrip to Hiroshima. You wouldn’t know that an atomic bomb had been dropped on Hiroshima if it weren’t for the one destroyed building that has been left as a reminder of what happened on August 6, 1945 and the Hiroshima Peace Memorial Museum. Today, large towers dominate the skyline, a street car system moves people from place to place, a large modern art museum sits at the top of a hill overlooking the city, and beautiful parks and paths dot the urban landscape. Hiroshima has made a full recovery, but something about it still felt damaged to me. It’s possible that I was just projecting my own feelings on to the city in the same way that it’s sometimes hard to make conversation with someone after they tell you about how a family member died tragically years before. They may no longer be reeling from the death, but your emotions are raw for a moment or two as you imagine going through what they did. Is it appropriate to act normal and to make small talk after someone shares this with you? What reaction will best convey your sympathy without seeming contrived? I walked through Hiroshima feeling uncertain about how I was supposed to feel and act there. I spent a few hours in the Peace Memorial Museum learning about Japan’s involvement in World War II, the $2 billion dollar Manhattan Project, the actual impact the bomb made on August 6th, and the residual health and environmental repercussions. The most genuine emotion I could say I felt was confusion. Why had this happened? I know there are innumerable scholarly books and PhD dissertations attempting to answer this question, but I’m not sure that reading any of those texts would have made me feel any less confused. I think part of the reason I felt especially confused by the atomic bombings, and war in general, was because I had just spent months traveling—in a fairly exposed fashion—and of the thousands of people I had encountered not a single one had tried to hurt me in any way. I may have been overcharged a few times, but for the most part I met people who went out of their way to help me in some way if they could. Sometimes I asked for help, but a lot of the time people just seemed to be looking for an opportunity to be kind. I left the museum and began walking across town. It started raining really hard. It had been sunny in Kyoto when I left and I didn’t bring my rain jacket. Luckily, I had my Haruki Murakami book with me so I just sat on some stairs under an awning and read. A woman walked by and said something to me in Japanese. I smiled and shook my head because I didn’t understand. She made a motion like she was opening an umbrella and I smiled again. I wasn’t sure what she was trying to tell me. She walked away. I kept reading. About 5 minutes later she came back with a little umbrella and handed it to me. She made it very clear that she was giving it to me. I thanked her several times. I truly was thankful for the umbrella because it kept raining for the rest of the afternoon, but I was also thankful because now I have a happy memory of Hiroshima. It’s a memory that will remind me that I didn’t need to be so afraid of traveling alone. It will remind me that there is a vast well of kindness out there in the world. Maybe I thought about the umbrella in Hiroshima after Ben gave me the helmet because it made me aware that travel isn’t the only way to experience the kindness of strangers. Like Ben said, cycling is a form of transportation that connects people. It forces us out of our bubbles and we notice each other, talk to each other, help each other, and begin to understand each other better. The Nanzenji temple in Kyoto. 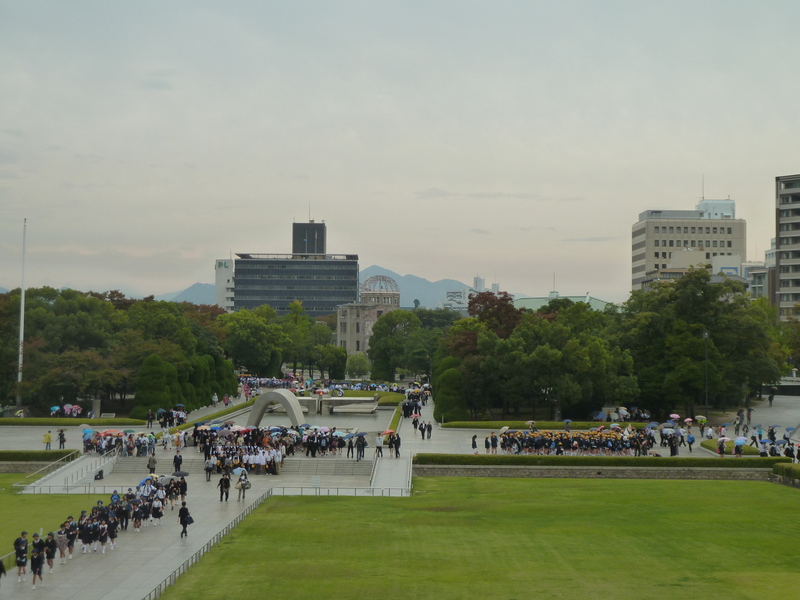 Peace Memorial Park in Hiroshima. Ben, Stella, and their cool Seattle pumpkin.